A team of seven from Devon Football Association has raised £2800 to support Brain Tumour Research, which has a Research Centre of Excellence at Plymouth University, by taking part in the Men’s Health Survival of the Fittest 10km assault course at Wembley. They trained for six months for the event, which involved at least 50 obstacles to be tackled on the 10km course. Around 7,500 people took part in the gruelling competition, which saw one of the Devon FA team break his foot at 5km but had to withdraw at 8km due to the injury. The team were supported by Santander. During the year Santander staff attended two of the events run by the Devon Junior and Minor League. The Santander Foundation was able to match the amount fund raised by the Santander staff on those days, and the total sum of £2800 is inclusive of this matched amount. Santander and Santander Universities staff have also supported Brain Tumour Research in other ways throughout the year. The money raised can pay for one day of research and entitles the Devon FA team to put a tile on the Brain Tumour Research Wall of Hope at the laboratories in Plymouth University Peninsula Schools of Medicine and Dentistry. 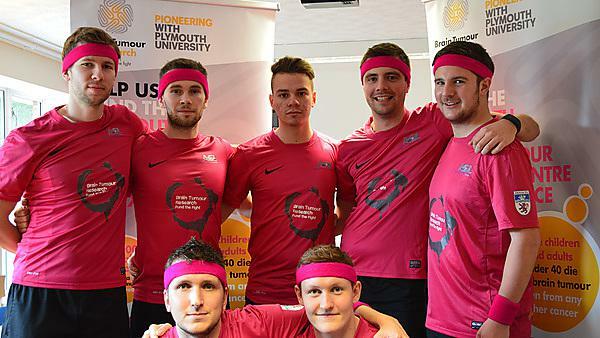 Devon FA has adopted Brain Tumour Research at Plymouth University as its charity this year, and this is just one of many activities planned to raise funds. Others include a football tournament with the Devon Junior and Minor League, coffee mornings, horse racing events and an It’s a Knockout event at the end of the season. Devon FA aims to raise at least £5484 by the end of the season – enough to pay for two days of research. Researchers in Plymouth are focusing on identifying and understanding the mechanism that makes a cell become cancerous. They are exploring ways in which to halt or reverse that mechanism. An innovation will be testing new drugs in human primary cell cultures leading to innovative phase 0 trials. It is hoped this will be followed by adaptive phase II/III trials with the potential for making drug therapies available to patients safely and more quickly. They are European leaders in this research relating to low grade brain tumours. Brain tumours kill more children and adults under the age of 40 than any other cancer yet just one per cent of the national spend on cancer research is allocated to this devastating disease. Brain Tumour Research is striving to fund a network of seven dedicated research centres whilst challenging the government to invest more in brain tumour research. The South West has the highest rate of brain tumours diagnosed per million in England.